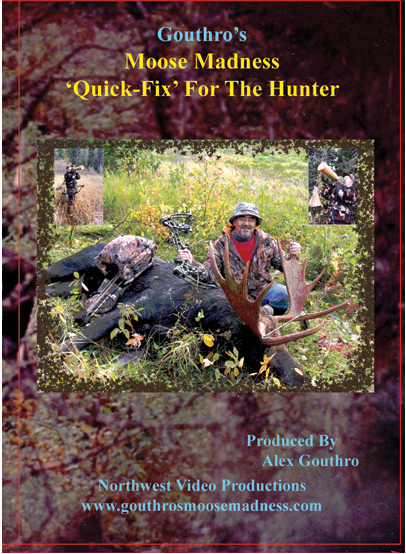 The Gouthro's Moose Madness 'Quick-Fix' For The Hunter is a single DVD about 115 minutes in length, giving the viewer almost two hours of action-packed instructional video on moose hunting & calling, with each DVD chapter building on the knowledge gained in previous chapters. This video is a comprehensive moose hunting guide that takes the hunter through all the essential steps to becoming a successful moose hunter & caller, and you get to see everything Alex talks about. The key word in this description is 'essential'. The topics have been carefully chosen to accommodate the needs of those with busy schedules -- hence the term 'Quick-Fix' in the title. This video is crammed-packed with valuable information for both beginner and old-time hunters and callers alike. While some of the film consists of newly-edited film from the Moose Madness Series On Moose Hunting & Calling, much of the film is new film, with new advice learned from more recent hunting & filming trips into moose country. Some new lessons learned are passed on in this 'Quick-Fix' production; e.g., the 'Tips' on hunting cows and on handling close 'hung-up' bulls. The Gouthro's Moose Madness 'Quick-Fix' For The Hunter represents years of experience accumulated by Alex Gouthro and his friends.